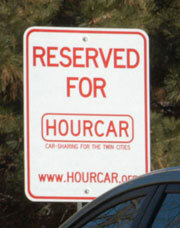 As part of the Transportation Fair that runs from 11 a.m.–2 p.m. today, Augsburg will officially launch HOURCAR. Stop and see HOURCAR in the Quad during this time and visit the booth at the fair for more information. Augsburg has opened a business account, which waives the registration fee for Augsburg users to drive the HOURCAR for business purposes. Members of the Augsburg community can also register for a personal account. 3. Click on the link "Additional Drivers"
4. Type "Augsburg College" in the line for "Member Name"
5. Fill in the rest of the form. Brief on-campus New Member Orientations will soon be scheduled for drivers under the Augsburg College membership. New Member Orientation is an opportunity to learn the details of HOURCAR membership as well as specific information related to driving a Toyota Prius. Each driver will also be asked to submit one "Attachment B" form and will receive his or her own key fob and login to the online reservation system at New Member Orientation. For additional information contact Kathleen Tuckner at x1403.